John Hindley shows how real joy can co-exist with real disappointment in this warm, realistic and above all hope-filled book. Life is disappointing. And disappointment can so easily come to dominate our life—the nagging thought in the back of our minds and the constant 'but' colouring all our pleasures. 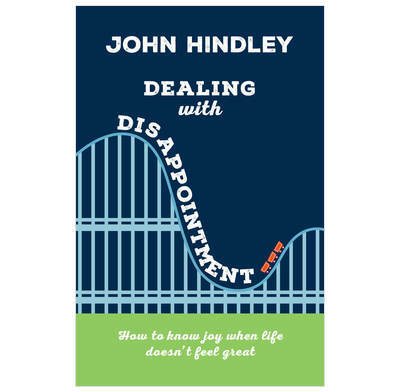 In this realistic, hope-filled book, John Hindley shows how to deal with disappointment — what disappointment is, what it does, and how to learn to live with the disappointments while also knowing joy. If your life isn't perfect… you need this book! Allows us to be honest about our disappointments, and then invites us to view them with a great purpose, a new perspective, and an unshakeable hope. A wonderful combination of biblical insight and down to earth wisdom. I am so grateful for this book. It was just what I needed to hear. It left me rejoicing afresh at the gospel which is able to totally transform how we view our circumstances, and to enable us to live lives with a real sense of purpose and contentment. This book can and should be life-transforming. We all get disappointed and this book puts several interesting ideas forward to help us come to terms with our experience. I appreciated the ideas of under disappointed and over disappointed and have started to use those terms when looking at my life. Also in the end all things come under the perspective of eternity. It is good to know it is OK to be disappointed and in some situations it is a sign of our longing for the coming of the King.